Author Marty Sederman and illustrator Zachary Pullen have "spun a hockey yarn...in the beloved rhythms of Casey at the Bat." Casey and Derek on the Ice give hockey families the chance to cheer on the underdogs. 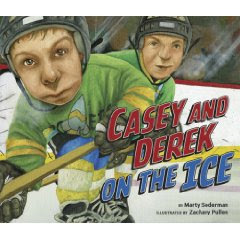 Poet Sederman writes about about Casey and Derek's hockey game. Casey wins the big face-off, and now it is up to Derek to score the tying goal. The fans cheer him on as he speeds down the ice. He cuts inside. He splits the defense. He's about to shoot....then CRASH! The classic story comes to hockey, although there is a twist. On the ensuing penalty shot, Casey gets a second chance to score the goal. Instead of coming up short like the original Casey way back in 1888, this Casey becomes the hero. This isn't the first time Casey at the Bat has been rewritten for hockey. In fact, just last year author Chris Mizzoni came out with Clancy With The Puck. While I raved about the book production and art work of Mizzoni's work, kids who read the book for me did not like the ending. All good stories have a hero come through in the end, right? That's especially true when you are a kid. So while my initial thoughts were Sederman's and Pullen's Casey And Derek On The Ice paled in comparison, the same kids liked the new book much better. So there you have it. Casey and Derek on the Ice is kid tested, and parent approved. The book is published by Chronicle Books in the United States, and distributed by Raincoast Books in Canada.